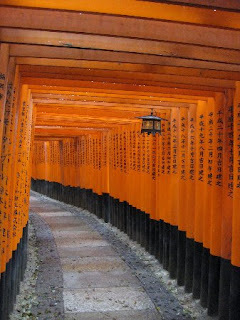 Kyoto private Guide: Fushimi Inari shrine. Have you ever seen the movie of "Memoirs of Geisha"? If so, do you remeber of the scene in which the young heroin was running under thousands of red torii gates? It was shot in Fushimi Inari shrine. Originately, Shinto is a nature worship. The people in the old days feared natural phenomena after starting agricutlure. They believed spirits lived in many objects like a rock, a tree, and a whole mountain. And Inari mountain regarded as Gods.In Shinto, it is said there are myriads of gods. 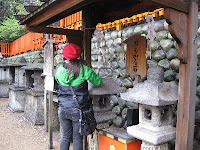 Inari shrines can be seen across the country and Fushimi Inari is the head shrine of them. At the beginning, it was the shrine for the god of rice. People in old days wished bumper crops in the year. Now, many people come to wish their business prosperity. 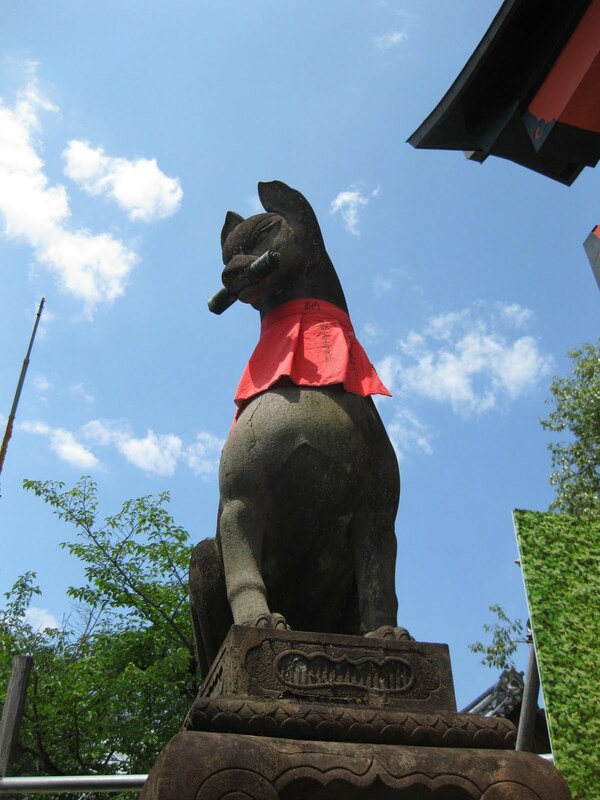 Usually a pair of lion-dogs, or lion-like creatures, could be seen in front of shrines. They are said to play a role as a guardian. 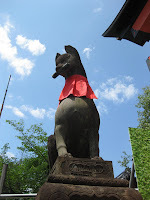 However, in Fushimi Inari, Foxes are to be seen in the place. They are regarded as a messenger of God. When in Inari shrine, look at the mouth of the foxes. Some have a scroll written how to make good rice in their mouth, others have a key of rice warehouses, a ball of soul, and a rice plant, all of which are related to rice farming. According to a legend, foxes came down from Inari mountain and got a little of rice plant and offered it to the mountain gods. That's why it is said a devine messenger. In the precinct, it has another shrine called Higashimaru. This shrine is good for academic achievement. Many students who are going to have exams like entrance exams come and pray for their success. 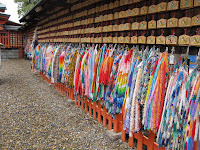 A thousand folded paper-cranes can be seen here. Of course, the characteristic point of this shrine for tourists is TORII TUNNEL. 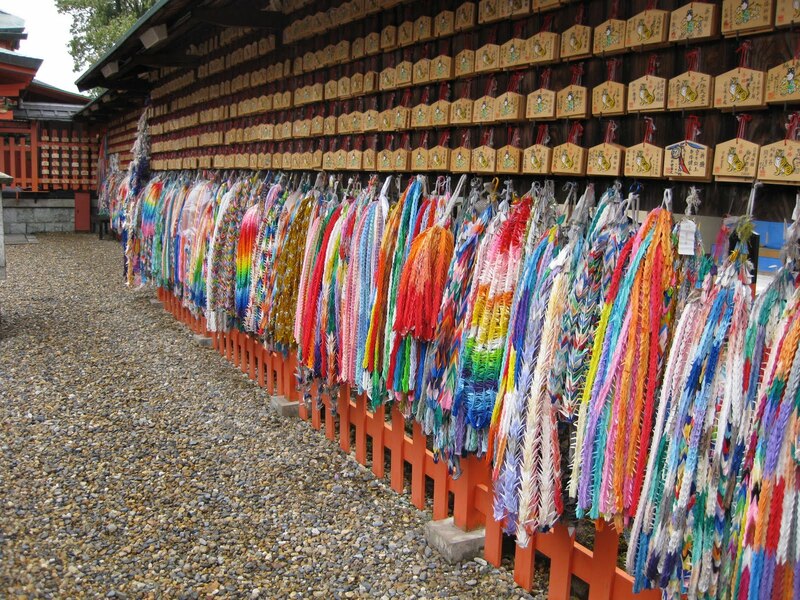 This links from one small shrine to the others in Inari mountain. If you walk all the legs to the top, it will take you about 2 hours. These toriis were donated by marchants and manufacturers showing their wishes and gratitudes of their success in business. It is said the price ranges from two hundred thousand yen to seven hundred thousand yen. When coming back, you see the donor's names and the date painted in black on the back of each torii gate. These donated toriis lining the paths are part of scenic view. In the second shirne when you get out of the first torii tunnel, there are so-called OMOKARU stones. Lift one of the stones after making a wish. If you feel it light, your wish will come true. If you feel it heavy, unfortunately your wish will not be realized. How do you feel? Please try it! I will give you a knack for feeling it light! Inari mountain itself is a holy mountain. Why don't you come and walk through the torii tunnel and feel something sacred? Fushimi Inari station of Keihan Line. They don't take an admission. You can visit early in the morning,too.